The fifth annual installment of the Inkjet Summit recently took place in Ponte Vedra, Florida. I have been lucky enough to attend all five Summits, and once again, it did not disappoint. Each year, approximately 100 printing company owners and senior-level operations and sales executives attend this invitation-only event. The Inkjet Summit is a one-of-a-kind event designed to educate industry leaders on the future of production inkjet printing technology and software solutions. Knowledge is shared through a combination of general sessions and case studies by both manufacturers and users of inkjet technology. I shared presentations on IWCO Direct’s new Screen Truepress 520 HD as well as our portfolio of Canon inkjet devices. The Inkjet Summit is also unique in that it is not sponsored by a single manufacturer, nor is it a user group focused on a single technology. Instead, it provides a vendor-agnostic forum for both new inkjet users and those experienced in inkjet technology to network and share experiences. Another unique feature is one that many attendees jokingly refer to as the “speed dating sessions.” These sessions provide attendees up to 12 opportunities to have one-on-one, 25-minute interactions with the vendor partners that sponsor the event. This includes equipment manufacturers, software and technology providers, as well as paper manufacturers. 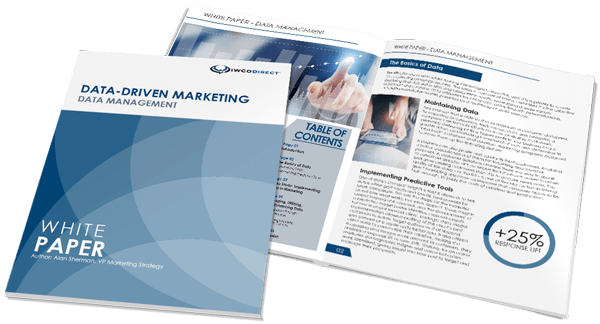 We spent a lot of time focused on new software workflow tools to improve the efficiency and accuracy of the increasingly complex effort to support dynamic content management, which drives one-to-one marketing with a digital press. I had several interesting conversations with a number of technology providers and will provide updates on these opportunities as we complete our due diligence and determine how we can incorporate the latest tools to enhance our service offerings. The other area of focus this year was paper. There are several exciting advances in inkjet-compatible papers, such as heavier stocks at more market-competitive prices and more options for coated sheets with both matte and gloss finishes. Domtar, Mondi, and Finch all have upped their game in this area. Prices for these stocks continue to improve as demand grows and mills allocate more research and development dollars to this production segment. Last but not least, all the major equipment manufacturers continue to improve their technologies. The overall print quality, color gamut of the inksets, and general reproduction on the latest generation of digital presses continue to make leaps forward. Of particular note, Screen’s new SC inkset and Canon’s ProStream press are taking inkjet print quality to new levels—which is one reason IWCO Direct will be moving our Screen press to the new SC inkset this summer. We anticipate an improved color gamut and truer base hues that will drive even more precise color fidelity for our clients. This past fall, we made a similar ink upgrade on our Canon ColorStreams with Canon’s new Chromera inkset. Canon also announced their new VarioPrint i200 sheet-fed inkjet, which is the little brother of our i300. It provides smaller shops a lower cost entry to the color inkjet sheet-fed market, broadening the accessibility of high-quality inkjet production technology. Once again, the Inkjet Summit exceeded expectations and provided a great venue for learning, sharing, and networking with the top manufacturers of inkjet equipment, software, and paper as well as networking with other leading service providers. I shared additional thoughts on the Inkjet Summit and advances with inkjet technology during a video interview with Mark Michelson, editor-in-chief of Printing Impressions magazine. Keep an eye on SpeakingDIRECT for updates on how we’ll leverage the new tools and tech exhibited at this year’s Inkjet Summit, and let me know if you’re curious about how IWCO Direct’s production capabilities can drive response and power your direct marketing campaigns.